Emitted aerosol particles are involved into atmospheric oxidation processes (also known as “ageing”). These processes permanently alter the chemical, (micro)-physical and toxilogical properties of airborne particles. 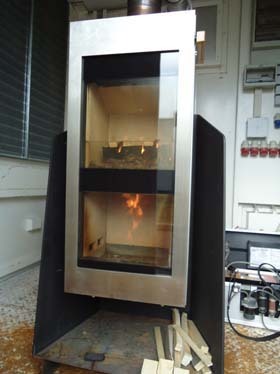 The aim of the studies performed at TROPOS is the characterization of the chemical and physical properties of freshly emitted and chemically processed wood combustion particles as well as the determination of the amount of secondary particulate matter. Therefore, the Leipzig Biomass Burning Facility (LBBF) was built. The LBBF consists of the wood stove, and first dilution system, a mixing and settling chamber and a dilution tunnel (Fig. 1). During the experiments particles are sampled on filters or size segregated on impactor foils at the end of the dilution tunnel. Additionally, to the chemical analysis the physical properties (hygroscopicity, volatility) of the particles are measured. 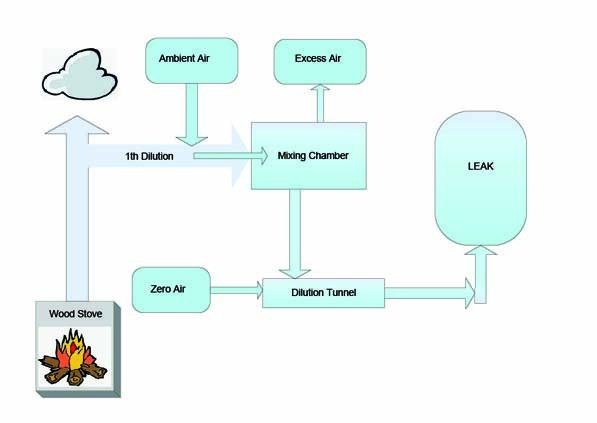 For studying the changes of the particle properties caused by atmospheric processes the diluted wood smoke is introduced in the aerosol chamber LEAK and chemically processed. During the each experiment the changes in the chemical and physical properties are measured. At the end of the experiment particles are sampled on filters for detailed chemical analysis.